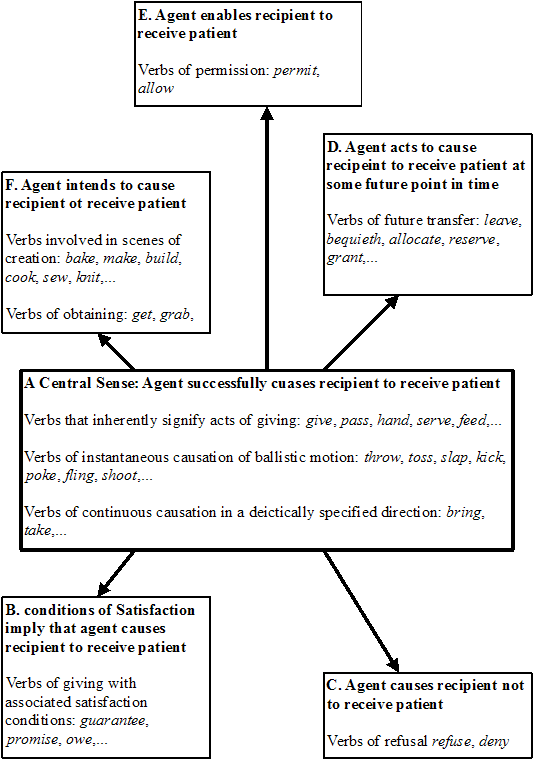 ・ Goldberg, Adele E. Constructions: A Construction Grammar Approach to Argument Structure. Chicago: U of Chicago P, 1995. C is a CONSTRUCTION iffdef C is a form-meaning pair <Fi, Si> such that some aspect of Fi or some aspect of Si is not strictly predictable from C's component parts or from other previously established constructions. Constructions are taken to be the basic units of language. Phrasal patterns are considered constructions if something about their form or meaning is not strictly predictable from the properties of their component parts or from other constructions. That is, a construction is posited in the grammar if it can be shown that its meaning and/or its form is not compositionally derived from other constructions existing in the language . . . . In addition, expanding the pretheoretical notion of construction somewhat, morphemes are clear instances of constructions in that they are pairings of meaning and form that are not predictable from anything else . . . . It is a consequence of this definition that the lexicon is not neatly differentiated from the rest of grammar. ・ Long life to them both! May Edward the Atheling reign, but Harold the Earl rule!--Lord Lytton. But it's backwaters that make the main stream. ---Galsworthy. It is not I that bleed---Binyon. ・ Traugott, Elizabeth Closs. "Grammaticalization." Chapter 15 of Continuum Companion to Historical Linguistics. Ed. Silvia Luraghi and Vit Bubenik. London: Continuum, 2010. 271--85. ・ Taylor, John R. Linguistic Categorization. 3rd ed. Oxford: OUP, 2003.